Note that Taniwani's San Blas tracks were originally made using GPS offsets to make the positions match the charts. As of 2011, the CM93v2 charts were still incorrectly placed for San Blas. We believe that we have successfully removed those offsets and that these track files are now corrected for WGS84. However, like all electronic aids to navigation, we recommend that you not depend solely on these tracks for your navigation through the San Blas Archipelago. See Taniwani's Panama & San Blas Islands Tracks in a larger map. 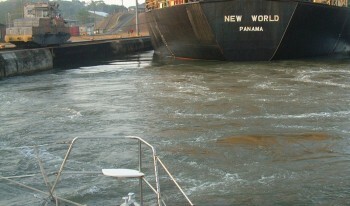 This page provides information for cruisers planning to transit the Panama Canal. The information is a bit dated as we last transited the Panama Canal in March 2003, but enough people have asked that we decided to put down what we know. We did not use an agent, and don't believe one is necessary as all the necessary offices are easy enough to find. When we went through in 1988, the US was controlling the Canal and the yachts were all grouped together and taken through in their own lock, once or twice a week. Now that the Panamanians have taken control, yachts have to lock through with big ships, behind them when going up and in front of them when going down. Anchoring: On the Caribbean side, most yachts anchor in "the flats" off Colon - a grubby, 45' (14m) deep cesspit of an anchorage and the Yacht Club is a long dinghy ride away, but at least it's free. Diesel was cheap and easy to get at the fuel-dock. Colon is supposed to be dangerous but we didn't have any problems. Taxis are cheap and plentiful, and busses to big Panama City were only $2 for the 2 hour ride. After the Caribbean, the tides of the Pacific can be a shock, as springs can run 20' (6m). Therefore, most boats on the Pacific side take a mooring off the Yacht Club, although a couple of new marinas are now operating. Yachts are now measured only for LOA, to determine transit fees. Costs have probably gone up since we went through (they've gone up 15%/year since 1988). In 2003 we paid US$500 for the passage (both Panama and Ecuador use US$ as their currency) and we also had to leave a $750 deposit, which we got back afterwards. The deposit could be by credit card, but the passage had to be paid in cash. These numbers were for boats up to 50' (15m) LOA - boats to 80' (24m) paid $750 and it was more for larger boats. 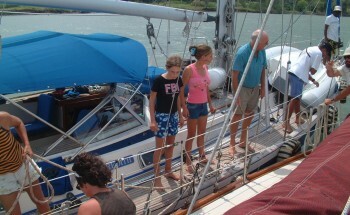 Boats over 65' (20m) had to take a pilot but smaller boats got an "advisor". The distinction is important: a pilot has legal responsibility for the boat but an advisor takes no such responsibility. His advice is just that, and the captain is responsible for the safety of his boat. Requirements: To go through the locks, all yachts need 5 people on board: 4 line-handlers and a helmsman. It doesn't matter if you won't need all the line-handlers, the rules say you need 4 of them on board. Most cruisers help each other, line-handling for one boat and then all taking the $2 bus back to take the next boat through. Yachts will also want lots of fenders. The locals will rent you tires wrapped in plastic but there's an easier way. Most yachts traverse the canal from the Caribbean to the Pacific, so the tires tend to accumulate on the Pacific side. Volunteer to help another yacht go through and when you see a yacht going the opposite direction, call them on the radio and request their tire/fenders. They'll be glad to get rid of them onto your deck. You will also need four 150' (50m) lines, or two 300' (100m) lines which can be rented if you don't have them. Line-handlers could be hired for about $60 per day per person. Our teenagers made some nice pocket money taking other boats through the Canal. When we went through, there was no surcharge for taking 2 days for the transit, but that may have changed by now - there's been talk of it for years. We made the mistake of telling the truth when they asked how fast we could motor (9+ knots) so they scheduled us for a 1 day transit, when we would much rather have spent a night in Gatun Lake. 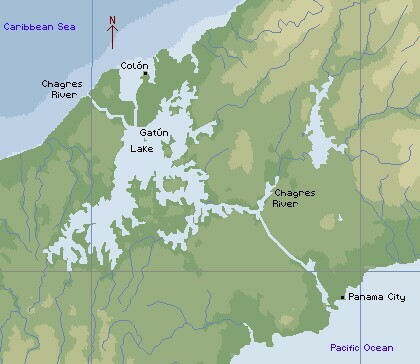 In 2003 the yachts anchored just before Culebra Cut, just opposite where the Chagres River flows into Gatun Lake (see map). I understand now that some yacht moorings have been put down in Gatun Lake, which is all 60' (18m) deep. and safest way to transit the canal. and 300' (100m) long docking lines. Yachts typically go through the locks in one of 4 configurations: Center tie (with their own lines going up to the walls of the lock), part of a raft of 2-3 boats tied together (with only the outer boats needing lines to the lock walls), tied to the wall of the lock, or side-tie to a tug. Side-tying to the lock wall is not recommended as the lock walls are extremely rough concrete. After trying each of the other 3 methods we found that side-tying to a tug was by far the safest and most comfortable. The trip down the 3 locks is a piece of cake - much easier than the trip up. Going up, if you need lines to the lock walls, the workers will throw you a "monkey's fist" connected to a thin line. They seem to enjoy aiming at vulnerable parts of your boat (like solar panels) so make sure everything breakable is covered with cushions. 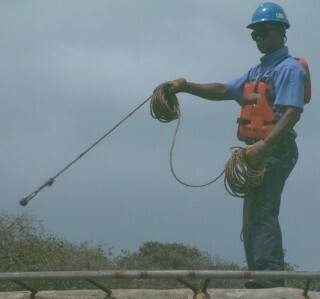 Tie the monkey's fist to a loop in the end of your line and the workers will pull it back and drop it over a bollard. This ends their involvement so your loop better hold. 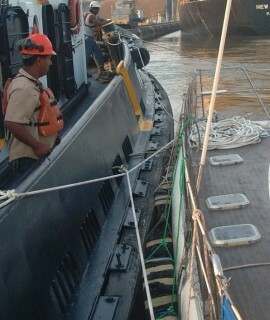 As the water rises, the line-handlers have to pull (very hard) to keep the boat(s) centered in the lock. Since the water, rising quickly from the bottom, grabs at keels and rudders, small boats get tossed around much more than most people imagine. But when the lock is full, don't relax! Most people think that the big boats are pulled through by the "donkey" railway engines they're tied to, but that's not the case - they have to push themselves through to the next lock with their propeller. This creates a veritable river of water that tries to push the yachts into the lock-door, so again the line-handlers have to be on their toes. Only when the big ship is settled in the next lock will the workers take your rope off the bollard and drop it into the water for you to recover. Side-tying to a tug-boat is much easier: The tug ties to the wall and then the yacht rafts to the tug, so there are no lines to adjust while the water buffets the boat around. (In fact, we toured the tug and gave them donuts, which were much appreciated.) After the ship moves to the next lock, the yacht unties from the tug (every time! ), waits for the tug to tie to the wall of the next lock, and then rafts to the tug again. Simple and easy. Those boats that have more questions, feel free to contact us and we'll answer as best we can.